What do I need for setting up at farmers’ market? Design your stand for shoppers: thoughts on what makes a good display and a poor one. Handling Your Money At Market: cash handling and counting tips. Marrying CSA and Farmers’ Market: a debit-type CSA works well at market. 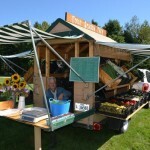 Selling Outdoors, the MFFM farmers’ market email newsletter, issued about once a month. Tips for markets and market members, news and pics from the markets. Many of the articles on this website first appeared in Selling Outdoors. These are some print and web-based information sources for information about farmers’ markets and farmers’ market culture, and other farm-related publications of interest to small-jscale farmers. The Best of Selling Outdoors, 2011 edition. A compilation of the best articles from the MFFM farmers’ market newsletter Selling Outdoors that was published from 1991 to 1997. Since hard copies are out of print, this pdf version was created for downloading. The only changes from the original 2000 edition are an update of the list of websites and fixing of typos. Growing For Market A national magazine for direct-to-consumer farmers published in Maine by market farmers Andrew and Ann Mefford of One Drop Farm in Cornville. Project for Public Spaces (PPS) is a nonprofit planning, design and educational organization dedicated to helping people create and sustain public spaces that build stronger communities. They help citizens transform public spaces into vital places that highlight local assets, spur rejuvenation and serve common needs. One excellent article they host, among others, is What We Need to Learn from America’s Classic Markets. The Art and Science of Farmers’ Market Display ©2009 Prepared by Mary L. Peabody, Community/Economic Development Specialist, University of Vermont Extension. Orono Farmers’ Market 1996 Consumer Survey done by University of Maine analysts. Much of the information in this report is still relevant today, and it is one of the only formal, academic farmers’ market surveys conducted in Maine. 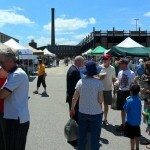 The Harrison Farmers’ Market is open every Friday, 1:00pm-5:00pm, late May through September. Our vendors bring produce, goat cheese, raw milk, maple syrup, eggs, highland beef, botanicals, and more!